For the islands of the sovereign state, see São Tomé and Príncipe. For other uses, see São Tomé (disambiguation) and Principe (disambiguation). São Tomé and Príncipe (/ˌsaʊ təˈmeɪ ... ˈprɪnsɪpə, -peɪ/; Portuguese: [sɐ̃w̃ tuˈmɛ i ˈpɾĩsɨpɨ]), officially the Democratic Republic of São Tomé and Príncipe, is an island country in the Gulf of Guinea, off the western equatorial coast of Central Africa. It consists of two archipelagos around the two main islands of São Tomé and Príncipe, about 140 kilometres (87 miles) apart and about 250 and 225 kilometres (155 and 140 miles) off the northwestern coast of Gabon, respectively. The islands were uninhabited until their discovery by Portuguese explorers in the 15th century. Gradually colonised and settled by the Portuguese throughout the 16th century, they collectively served as a vital commercial and trade center for the Atlantic slave trade. The rich volcanic soil and close proximity to the Equator made São Tomé and Príncipe ideal for sugar cultivation, followed later by cash crops such as coffee and cocoa; the lucrative plantation economy was heavily dependent upon imported African slaves. Cycles of social unrest and economic instability throughout the 19th and 20th centuries culminated in peaceful independence in 1975. São Tomé and Príncipe has since remained one of Africa's most stable and democratic countries. With a population of 199,910 (2016 estimate), São Tomé and Príncipe is the second-smallest African sovereign state after Seychelles, as well as the smallest Portuguese-speaking country. Its people are predominantly of African and mestiço descent, with most practising Roman Catholicism. The legacy of Portuguese rule is also visible in the country's culture, customs, and music, which fuse European and African influences. São Tomé and Príncipe is a founding member state of the Community of Portuguese Language Countries (CPLP). Map of São Tomé by Johannes Vingboons (1665). The islands of São Tomé and Príncipe (english translation Saint Thomas and Prince) were uninhabited when the Portuguese arrived sometime around 1470. The islands were discovered by João de Santarém and Pêro Escobar. Portuguese navigators explored the islands and decided that they would be good locations for bases to trade with the mainland. The dates of discovery are sometimes given as 21 December (St Thomas's Day) 1471, for São Tomé; and 17 January (St Antony's Day) 1472, for Príncipe, though other sources cite different years around that time. Príncipe was initially named Santo Antão ("Saint Anthony"), changing its name in 1502 to Ilha do Príncipe ("Prince's Island"), in reference to the Prince of Portugal to whom duties on the island's sugar crop were paid. The first successful settlement of São Tomé was established in 1493 by Álvaro Caminha, who received the land as a grant from the crown. Príncipe was settled in 1500 under a similar arrangement. Attracting settlers proved difficult, however, and most of the earliest inhabitants were "undesirables" sent from Portugal, mostly Jews. In time these settlers found the volcanic soil of the region suitable for agriculture, especially the growing of sugar. By 1515, São Tomé and Príncipe had become slave depots for the coastal slave trade centered at Elmina. The cultivation of sugar was a labour-intensive process and the Portuguese began to enslave large numbers of Africans from the mainland. By the mid-16th century the Portuguese settlers had turned the islands into Africa's foremost exporter of sugar. São Tomé and Príncipe were taken over and administered by the Portuguese crown in 1522 and 1573, respectively. However, competition from sugar-producing colonies in the Western Hemisphere began to hurt the islands. The large enslaved population also proved difficult to control, with Portugal unable to invest many resources in the effort. Sugar cultivation thus declined over the next 100 years, and by the mid-17th century, the economy of São Tomé had changed. It was now primarily a transit point for ships engaged in the slave trade between the West and continental Africa. In the early 19th century, two new cash crops, coffee and cocoa, were introduced. The rich volcanic soils proved well suited to the new cash crop industry, and soon extensive plantations (known as "roças"), owned by Portuguese companies or absentee landlords, occupied almost all of the good farmland. By 1908, São Tomé had become the world's largest producer of cocoa, which remains the country's most important crop. The roças system, which gave the plantation managers a high degree of authority, led to abuses against the African farm workers. Although Portugal officially abolished slavery in 1876, the practice of forced paid labour continued. Scientific American magazine documented in words and pictures the continued use of slaves in São Tomé in its 13 March 1897 issue. In the early 20th century, an internationally publicized controversy arose over charges that Angolan contract workers were being subjected to forced labour and unsatisfactory working conditions. Sporadic labor unrest and dissatisfaction continued well into the 20th century, culminating in an outbreak of riots in 1953 in which several hundred African laborers were killed in a clash with their Portuguese rulers. This "Batepá Massacre" remains a major event in the colonial history of the islands, and its anniversary is officially observed by the government. By the late 1950s, when other emerging nations across the African Continent demanded their independence, a small group of São Toméans had formed the Movement for the Liberation of São Tomé and Príncipe (MLSTP), which eventually established its base in nearby Gabon. Picking up momentum in the 1960s, events moved quickly after the overthrow of the Caetano dictatorship in Portugal in April 1974. The new Portuguese regime was committed to the dissolution of its overseas colonies. In November 1974, their representatives met with the MLSTP in Algiers and worked out an agreement for the transfer of sovereignty. After a period of transitional government, São Tomé and Príncipe achieved independence on 12 July 1975, choosing as the first president the MLSTP Secretary General Manuel Pinto da Costa. In 1990, São Tomé became one of the first African countries to undergo democratic reform, and changes to the constitution – the legalization of opposition political parties – led to elections in 1991 that were nonviolent, free, and transparent. Miguel Trovoada, a former prime minister who had been in exile since 1986, returned as an independent candidate and was elected president. Trovoada was re-elected in São Tomé's second multi-party presidential election in 1996. The Party of Democratic Convergence (PCD) won a majority of seats in the National Assembly, with the MLSTP becoming an important and vocal minority party. Municipal elections followed in late 1992, in which the MLSTP won a majority of seats on five of seven regional councils. In early legislative elections in October 1994, the MLSTP won a plurality of seats in the Assembly. It regained an outright majority of seats in the November 1998 elections. Presidential elections were held in July 2001. The candidate backed by the Independent Democratic Action party, Fradique de Menezes, was elected in the first round and inaugurated on 3 September. Parliamentary elections were held in March 2002. For the next four years, a series of short-lived opposition-led governments were formed. The army seized power for one week in July 2003, complaining of corruption and that forthcoming oil revenues would not be divided fairly. An accord was negotiated under which President de Menezes was returned to office. The cohabitation period ended in March 2006, when a pro-presidential coalition won enough seats in National Assembly elections to form a new government. In the 30 July 2006 presidential election, Fradique de Menezes easily won a second five-year term in office, defeating two other candidates Patrice Trovoada (son of former President Miguel Trovoada) and independent Nilo Guimarães. Local elections, the first since 1992, took place on 27 August 2006 and were dominated by members of the ruling coalition. On 12 February 2009, there was an attempted coup d'état to overthrow President Fradique de Menezes. The coup plotters were imprisoned, but later received a pardon from President de Menezes. The president of the republic is elected to a five-year term by direct universal suffrage and a secret ballot, and must gain an outright majority to be elected. The president may hold up to two consecutive terms. The prime minister is appointed by the president, and the fourteen members of cabinet are chosen by the prime minister. The National Assembly, the supreme organ of the state and the highest legislative body, is made up of 55 members, who are elected for a four-year term and meet semiannually. Justice is administered at the highest level by the Supreme Court. The judiciary is independent under the current constitution. São Tomé has functioned under a multiparty system since 1990. With regard to human rights in São Tomé, there are freedom of speech and the freedom to form opposition political parties. São Tomé and Príncipe finished 11th out of the African countries measured by the Ibrahim Index of African Governance in 2010, a comprehensive reflection of the levels of governance in Africa. São Tomé and Príncipe has embassies in Angola, Belgium, Gabon, Portugal and the United States. It recognized the People's Republic of China in 2016. It also has a permanent mission to the UN in New York City and an International Diplomatic Correspondent Office. 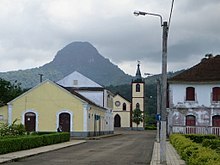 São Tomé and Príncipe is a founding member state of the Community of Portuguese Language Countries (CPLP), also known as the Lusophone Commonwealth, and international organization and political association of Lusophone nations across four continents, where Portuguese is an official language. 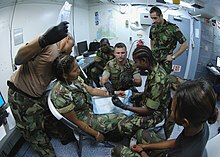 São Tomé and Príncipe's military is small and consists of four branches: the Army (Exército), Coast Guard (Guarda Costeira also called "Navy"), Presidential Guard (Guarda Presidencial), and the National Guard. 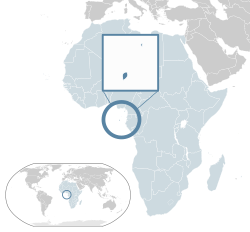 The islands of São Tomé and Príncipe, situated in the equatorial Atlantic and Gulf of Guinea about 300 and 250 kilometres (190 and 160 mi), respectively, off the northwest coast of Gabon, constitute Africa's second-smallest country. Both are part of the Cameroon volcanic mountain line, which also includes the islands of Annobón to the southwest, Bioko to the northeast (both part of Equatorial Guinea), and Mount Cameroon on the coast of Gulf of Guinea. São Tomé is 50 km (30 mi) long and 30 km (20 mi) wide and the more mountainous of the two islands. Its peaks reach 2,024 m (6,640 ft) – Pico de São Tomé. Príncipe is about 30 km (20 mi) long and 6 km (4 mi) wide. Its peaks reach 948 m (3,110 ft) – Pico de Príncipe. Swift streams radiating down the mountains through lush forest and cropland to the sea cross both islands. The Equator lies immediately south of São Tomé Island, passing through the islet Ilhéu das Rolas. 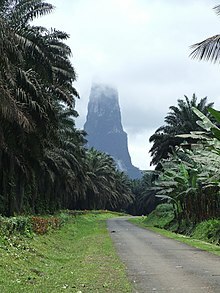 The Pico Cão Grande (Great Dog Peak) is a landmark volcanic plug peak, at 0°7′0″N 6°34′00″E﻿ / ﻿0.11667°N 6.56667°E﻿ / 0.11667; 6.56667 in southern São Tomé. It rises over 300 m (1,000 ft) above the surrounding terrain and the summit is 663 m (2,175 ft) above sea level. At sea level, the climate is tropical—hot and humid with average yearly temperatures of about 27 °C (80.6 °F) and little daily variation. The temperature rarely rises beyond 32 °C (89.6 °F). At the interior's higher elevations, the average yearly temperature is 20 °C (68 °F), and nights are generally cool. Annual rainfall varies from 5,000 mm (196.9 in) on the southwestern slopes to 1,000 mm (39.4 in) in the northern lowlands. The rainy season is from October to May. São Tomé and Príncipe does not have a large number of native mammals (although the São Tomé shrew and several bat species are endemic). The islands are home to a larger number of endemic birds and plants, including the world's smallest ibis (the São Tomé ibis), the world's largest sunbird (the giant sunbird), the rare São Tomé fiscal, and several giant species of Begonia. São Tomé and Principe is an important marine turtle nesting site, including the hawksbill turtles (Eretmochelys imbricata). Since the 19th century, the economy of São Tomé and Príncipe has been based on plantation agriculture. At the time of independence, Portuguese-owned plantations occupied 90% of the cultivated area. After independence, control of these plantations passed to various state-owned agricultural enterprises. The main crop on São Tomé is cocoa, representing about 95% of agricultural exports. Other export crops include copra, palm kernels, and coffee. Domestic food-crop production is inadequate to meet local consumption, so the country imports most of its food. In 1997 it was estimated that approximately 90% of the country's food needs are met through imports. Efforts have been made by the government in recent years to expand food production, and several projects have been undertaken, largely financed by foreign donors. Other than agriculture, the main economic activities are fishing and a small industrial sector engaged in processing local agricultural products and producing a few basic consumer goods. The scenic islands have potential for tourism, and the government is attempting to improve its rudimentary tourist industry infrastructure. The government sector accounts for about 11% of employment. Following independence, the country had a centrally directed economy with most means of production owned and controlled by the state. The original constitution guaranteed a mixed economy, with privately owned cooperatives combined with publicly owned property and means of production. In the 1980s and 1990s, the economy of São Tomé encountered major difficulties. Economic growth stagnated, and cocoa exports dropped in both value and volume, creating large balance-of-payments deficits. Plantation land was seized, resulting in the complete collapse of cocoa production. At the same time, the international price of cocoa slumped. In response to its economic downturn, the government undertook a series of far-reaching economic reforms. In 1987, the government implemented an International Monetary Fund (IMF) structural adjustment program, and invited greater private participation in management of the parastatals, as well as in the agricultural, commercial, banking, and tourism sectors. The focus of economic reform since the early 1990s has been widespread privatization, especially of the state-run agricultural and industrial sectors. The São Toméan Government has traditionally obtained foreign assistance from various donors, including the UN Development Programme, the World Bank, the European Union (EU), Portugal, Taiwan, and the African Development Bank. In April 2000, in association with the Banco Central de São Tomé e Príncipe, the IMF approved a poverty reduction and growth facility for São Tomé aimed at reducing inflation to 3% for 2001, raising ideal growth to 4%, and reducing the fiscal deficit. In late 2000, São Tomé qualified for significant debt reduction under the IMF–World Bank's Heavily Indebted Poor Countries (HIPC) initiative. The reduction is being reevaluated by the IMF, due to the attempted coup d'état in July 2003 and subsequent emergency spending. Following the truce, the IMF decided to send a mission to São Tomé to evaluate the macroeconomic state of the country. This evaluation is ongoing, reportedly pending oil legislation to determine how the government will manage incoming oil revenues which are still poorly defined, but in any case expected to change the economic situation dramatically. In parallel, some efforts have been made to incentivize private tourism initiatives, but their scope remains limited. São Tomé also hosts a broadcasting station of the American International Broadcasting Bureau (IBB) for the Voice of America at Pinheira. Portugal remains one of São Tomé's major trading partners, particularly as a source of imports. Food, manufactured articles, machinery, and transportation equipment are imported primarily from the EU. São Tomé and Príncipe was ranked the 174th-safest investment destination in the world in the March 2011 Euromoney Country Risk rankings. In 2001, São Tomé and Nigeria reached agreement on joint exploration for petroleum in waters claimed by the two countries of the Niger Delta geologic province. After a lengthy series of negotiations, in April 2003 the joint development zone (JDZ) was opened for bids by international oil firms. The JDZ was divided into nine blocks; the winning bids for block one, ChevronTexaco, ExxonMobil, and the Norwegian firm, Equity Energy, were announced in April 2004, with São Tomé to take in 40% of the $123 million bid, and Nigeria the other 60%. Bids on other blocks were still under consideration in October 2004. São Tomé has received more than $2 million from the bank to develop its petroleum sector. Banco Central de Sāo Tomé e Príncipe is the central bank, responsible for monetary policy and bank supervision. There are six banks in the country. The largest and oldest is Banco Internacional de São Tomé e Príncipe, which is a subsidiary of Portugal's government-owned Caixa Geral de Depósitos. It had a monopoly on commercial banking until a change in the banking law in 2003 led to the entry of several other banks. The first ever census was carried out in 2011 with the help of the National Statistic Institute (INE) of Cape Verde. The total population is estimated at 163,784 in 2010 by the government agency. Approximately 157,000 people live on São Tomé and 6,000 on Príncipe. Nearly all are descended from people from different countries taken to the islands by the Portuguese from 1470 onwards. In the 1970s, there were two significant population movements—the exodus of most of the 4,000 Portuguese residents and the influx of several hundred São Tomé refugees from Angola. Mestiços, or mixed-blood, descendants of Portuguese colonists and African slaves brought to the islands during the early years of settlement from Benin, Gabon, the Republic of the Congo, the Democratic Republic of the Congo, and Angola (these people also are known as filhos da terra or "children of the land"). Angolares, reputedly descendants of Angolan slaves who survived a 1540 shipwreck and now earn their livelihood fishing. Forros, descendants of freed slaves when slavery was abolished. Serviçais, contract laborers from Angola, Mozambique, and Cape Verde, living temporarily on the islands. Tongas, children of serviçais born on the islands. Asians, mostly Chinese, including Macanese people of mixed Portuguese and Chinese descent from Macau. Portuguese is the official and the de facto national language of São Tomé and Príncipe, with about 98.4% speaking it in the country, a significant share of it as their native language, and it has been spoken in the islands since the end of the 15th century. Restructured variants of Portuguese or Portuguese creoles are also spoken: Forro, a creole language (36.2%), Cape Verdean Creole (8.5%), Angolar (6.6%) and Principense (1%). French (6.8%) and English (4.9%) are foreign languages taught in schools. The majority of residents belong to the local branch of the Roman Catholic Church, which in turn retains close ties with the church in Portugal. There are also sizeable Protestant minorities of Seventh-day Adventists and other Evangelical Protestants. There is a small but growing Muslim population. Education in São Tomé and Príncipe is compulsory for four years. Primary school enrollment and attendance rates were unavailable for São Tomé and Príncipe as of 2001. The educational system has a shortage of classrooms, insufficiently trained and underpaid teachers, inadequate textbooks and materials, high rates of repetition, poor educational planning and management, and a lack of community involvement in school management. Domestic financing of the school system is lacking, leaving the system highly dependent on foreign financing. Tertiary institutions are the National Lyceum (São Tomé and Príncipe) and the University of São Tomé and Príncipe. São Toméans are known for ússua and socopé rhythms, while Príncipe is home to the dêxa beat. Portuguese ballroom may have played an integral part in the development of these rhythms and their associated dances. Staple foods include fish, seafood, beans, maize and cooked banana. Tropical fruits such as pineapple, avocado and bananas are a significant component of the cuisine. The use of hot spices is prominent in São Tomése cuisine. Coffee is utilized in various dishes as a spice or seasoning. Breakfast dishes are often reheated leftovers from the previous evening's meal, and omelettes are popular. Football is the most famous sport in São Tomé and Principe, the São Tomé and Príncipe national football team is the national association football team of São Tomé and Príncipe and is controlled by the São Toméan Football Federation. It is a member of the Confederation of African Football (CAF) and FIFA. ^ "Nationality". The World Factbook. Retrieved July 17, 2012. ^ Octávio Amorim Neto; Marina Costa Lobo (2010). "Between Constitutional Diffusion and Local Politics: Semi-Presidentialism in Portuguese-Speaking Countries". Social Science Research Network. SSRN 1644026. Retrieved June 6, 2014. ^ "Ministério Dos Negócios Estrangeiros e Comunidades da República Democrática de São Tomé e Príncipe". ^ a b c d "São Tomé and Príncipe". International Monetary Fund. Retrieved 2013-04-17. ^ "GINI index". World Bank. Retrieved 26 July 2013. ^ "São Tomé – Definition of São Tomé". Yourdictionary.com. 2013-09-25. Retrieved 2013-09-29. ^ "The Expulsion 1492 Chronicles, section XI: "The Vale of Tears", quoting Joseph Hacohen (1496–1577); also, section XVII, quoting 16th century author Samuel Usque". Aish.com. 2009-08-04. Retrieved 2013-09-29. ^ Ivor Wilks and Akan Wangara (January 1997). "Portuguese in the Fifteenth and Sixteenth Centuries". In Peter John Bakewell. Mines of Silver and Gold in the Americas. Aldershot: Variorum. p. 24. ISBN 978-0-86078-513-2. ^ Gerhard Seibert (2006), Comrades, Clients and Cousins: Colonialism, Socialism and Democratization in São Tomé and Príncipe, Leiden: Brill. ^ Sao Tome president pardons coup plotter. Orange Botswana Portal. January 7, 2010. ^ Nunes Silva, Carlos (2016). "São Tomé and Príncipe". Governing Urban Africa. Springer Nature. pp. 35–39. ISBN 9781349951093 – via Google Books. ^ a b Mary E. Lassanyi; Wayne Olson (1 July 1997). Agricultural Marketing Directory for U.S. & Africa Trade. DIANE Publishing. p. 206. ISBN 978-0-7881-4479-0. ^ Phuong Tran (1 February 2007). "São Tomé & Príncipe Still Waiting for Oil Boom". VOA News. Voice of America. Retrieved 25 December 2008. ^ "Cape Verde supports population census in Sao Tome and Principe". Inforpress. 6 April 2011. ^ População: Observada, Estimada e Projectada (1991/2001). Ine.st. Retrieved on 2013-08-09. ^ São Tomé and Principe. pewforum.org. ^ a b c d "São Tomé and Príncipe". 2001 Findings on the Worst Forms of Child Labor. Bureau of International Labor Affairs, U.S. Department of Labor (2002). This article incorporates text from this source, which is in the public domain. ^ a b c The Recipes of Africa. Dyfed Lloyd Evans. pp. 174–176. ^ a b Kathleen Becker (23 July 2008). Sao Tome and Principe. Bradt Travel Guides. pp. 74–79. ISBN 978-1-84162-216-3. ^ "BBC Sport – Sao Tome e Principe rocket up Fifa rankings". Bbc.co.uk. 2012-03-07. Retrieved 2013-12-03. Wikivoyage has a travel guide for São Tomé and Príncipe. Wikimedia Commons has media related to São Tomé and Príncipe. Look up são tomé and príncipe in Wiktionary, the free dictionary. "São Tomé and Príncipe". The World Factbook. Central Intelligence Agency.